Located on the highlands of Pahang, Malaysia, this tea plantation not only has a great significance in the tea production of Malaysia but also offers mind boggling views to the visitors. You can explore more about the tea gardens by taking a walk through them. As you reach the top of the highland, you will get a better view of the place. You can also pay a visit to the tea factory nearby. You will find some local people who will explain the procedure of tea production to you. Your visit is in vain if you don’t taste the tea made with fresh leaves here. 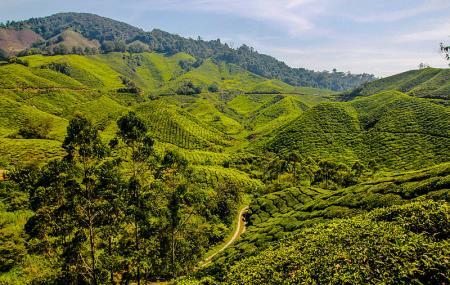 An ideal Cameron Highlands trip includes top things to do in Cameron Highlands like Mossy Forest, Cameron Bharat Tea Estate, Big Red Strawberry Farm, Time Tunnel Museum and Sam Poh Temple . Make your visit suitable to your interest, use Cameron Highlands trip planner for personalization. You can enjoy a comfortable stay in the city by booking the best hotels in Cameron Highlands like Ria Cameron Hotel, E Resort and Copthorne Cameron Highlands. Create your own Cameron Highlands vacation packages or choose from the ones made by travel experts. Also explore the best ways for how to reach Cameron Highlands. How popular is Boh Tea Plantation? People normally club together Boh Tea Estate and Time Tunnel (the Local Museum) while planning their visit to Boh Tea Plantation. Weather was nice and cool. Tourist center was informative and pleasant. I recommend booking a tour guide and going to the Mossy Forest at the same time. Avoid public holidays. The view point was breathtaking beautiful but the cafe is actually so small and the menu provided are limited. Please add more menu in the cafe. Oldest Tea Plantation In Malaysia Located In Cameron Highlands. You Can Get An Idea Of Tea Manufacturing Process In This Plantation. Wounderful Cafeteria With Beautiful Scenic View. A great alternative to the other big commercial plantations and tea shops. Big buses can not get up there but ok by car, the road is all sealed. Walk up hill from Cafe to get a good view. All free, take a short walk through factory too but of course can buy tea, and have tea and snacks at the small shop. Very peaceful. Busy weekends, closed Mondays. No signs on main road, turn for bee farm and keep going and going, until you will eventually see signs. Worth the long drive uphill. Tranquil and very clean ! They are doing a very good job with the upkeep. Fantastic view of the Indian tea estate. The tea and cookies are excellent !